Turn on keyboard shortcuts: Why waste time moving your hand to the mouse every time you want to open, compose, search for, or label an e-mail message? Gmail's keyboard shortcuts keep your hands on the home row and your inbox clean. To activate them (they're not enabled by default), open the General tab of your Gmail settings, enable keyboard shortcuts, and hit the ? key from anywhere in Gmail to see a full run-down of your shortcuts at any time. Google Calendar shares many of the same shortcuts (including the ‘?' query) and enables them by default. 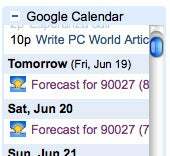 Add a dynamic list of your Google Calendar appointments to your Gmail sidebar. 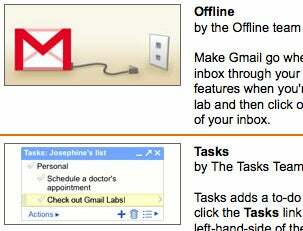 Enable Offline Gmail, Tasks, and other experimental features through Gmail Labs. 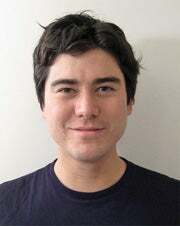 "The Gmail feature I can't live without is search operators. I'm a huge fan of keyboard shortcuts, so when I need to find something quickly, I hit ‘/' to get to the search box and then type in ‘from:keith' plus a keyword that's in the mail I'm looking for that Keith sent me. Make sure you have keyboard shortcuts turned on for the ‘/' shortcut to work. Also, there's a whole list of other tips and tricks for becoming a Gmail ninja here: www.gmail.com/tips."